The daily podcast was once the domain of comedians and audiocasts of ESPN’s Pardon The Interruption. But with the New York Times’ launch of The Daily in 2017 and its immediate success, the Monday-to-Friday podcast took on new life, proving that it could serve as a centerpiece for mainstream media institutions and, as Wired recently reported, as a money well. The Daily’s triumph demonstrated an incredible thirst for digestible, commute-length news podcasts. 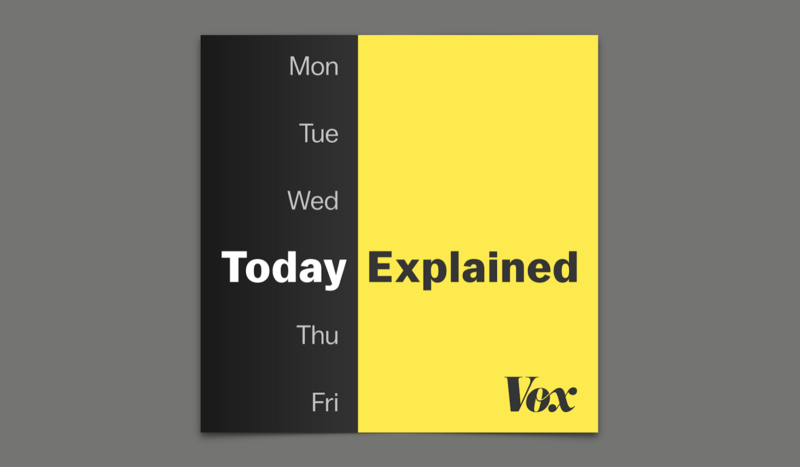 Now, Today, Explained has arrived with the weight of the Vox empire behind it. Today, Explained is destined to be measured against The Daily. And both for its popularity and its association with a newspaper the rest of the media is obligated to aggrandize, The Daily is likely to be seen as the genre’s standard for the foreseeable future. For its part Today, Explained has distinguished itself as The Daily’s looser counterpart, a tone set by the show’s enthusiastic host, Sean Rameswaram. Rameswaram has an amiable touch and a generosity as an interviewer that lends his version of daily news a rare optimism. While the authority of the Times and and Michael Barbaro’s NPR-voice give The Daily a certain seriousness, Rameswaram keeps it light. His style of interviewing is friendly, and he’s interested in proving that the news doesn’t have to be rigid. For a show with a conventional format, Today, Explained relies on Rameswaram’s eager personality to convince listeners to return. That format bares a lot in common with The Daily’s. On both shows, the host brings on a guest, often an in-house writer, and interviews them about their area of expertise. On The Daily, the spotlight tends to be a single Times article, whichever it deems the day’s most urgent. The result is that show’s coverage is dominated by the Russia investigation. In launching a daily podcast, The Times’ mission surely had a lot to do with pushing the newspaper’s front page to a broader, younger audience. In this way, The Daily’s editorial priorities become indistinguishable from the newspaper’s—and that paper loves Robert Mueller. Today, on the other hand, has made the excellent decision to focus each episode not on the day’s top headline, but on a matter that will be as relevant in six months as it is today. Topics covered thus far include the water crisis in South Africa, the gutting of Obamacare, and the Syrian Civil War. And when the day does have an obvious lede, Rameswaram and the Today team use it as an entry point into something bigger, like using the Parkland town hall on gun policy to talk about the epidemic of suicide gun deaths, or the NCAA’s Sweet Sixteen weekend to probe the future of unpaid labor in college basketball. At the end of particularly policy-heavy episodes, Rameswaram often asks his guests for a three-step solution to the existing problem. Ambitious as these goals tend to be, it’s the segment that makes me like Today, Explained best. Embedded in these segments is the belief that this podcast can be palliative, and that our broken system needs a whole lot more than the special counsel to get fixed. Like any young podcast, Today has had its missteps. The show is often too cute, and I’m not one who enjoys song parodies in my news podcasts. The second episode, which argued that Black Panther is the most important movie of 2018, went a bit beyond their range, with better pop culture podcasting available elsewhere. There was also its otherwise strong coverage of Cambridge Analytica, unfortunately interrupted by ads for the Google Cloud Platform’s weekly podcast. Still, the slip-ups have been minor, and each week the show grows, refining the scope of stories it wants to tell. Ezra Klein, Vox’s co-founder and the face of the organization, has made explaining central to Vox’s brand since its inception. In the hands of Vox’s best writers these policy guides are the site’s most valuable work. In the wrong hands, the “, explained” attached to the end of any title is condescending, a needless reminder that Vox has proclaimed itself the definitive home of policy-focused journalism. But in Sean Rameswaram, Vox has found its best ambassador. With his encouraging voice at its center, Today has chosen to sculpt each day’s news as part of a greater whole, one piece of the big mess. This is difficult work. Traditional news doesn’t have much memory or foresight; each day, like a network sitcom, is supposed to be self-contained. Today is doing its best to untangle news from this cycle, to investigate stories over the course of weeks and months rather than hours. The existence of Today, Explained proves the flexibility of the daily news podcast, of which many more are surely on the way. If Rameswaram and company stay the course and avoid the trappings of daily headlines, Today, Explained could be your least panicky and most curious news option. Next PostWhat Has Become of My Puerto Rico Now That the Storm Has Passed?